Finally, I’m coming around to close to the end of the Block-a-Month Crochet-Along squares that I caught up on over my vacation (because what else is a vacation for, if not for lots of crochet?). 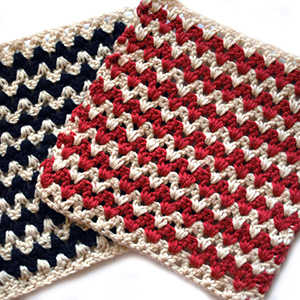 These really are some beautiful crochet squares. I loved as each of these emerged with their own color and personality. The Hayton Block, above, is one of my top favorite squares that I made. It’s a beautiful crochet combination of varying textures and I love how the color placement options can make it floral and feminine too. My project page for this square is here, and you can download the free pattern here on Ravelry. 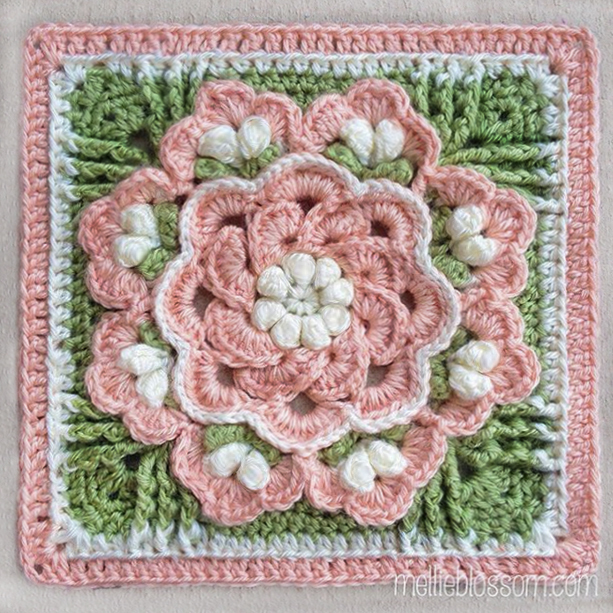 The square selected for the month of October is this beautiful crochet block called Dream Circle Square. It’s a free pattern that can be found here. I had a lot of fun with this because of the variety of color placement ideas and the change of stitches kept it interesting. The square can be extended with another pattern on the linked page as well, which is what I continued on using until it reached the 12″ I was aiming for. My project page on Ravelry for this one is here. I was also happily surprised when the Tropical Delight square was selected as a filler square for the Block-of-the-Month Crochet Along group. Unfortunately, I was out of town and didn’t even realize it until much later, and was very late in answering questions about the pattern, so my apologies to anyone who may have been waiting on my response. It was a lot of fun to make this up in separate colors than the County Fair blanket that I’ve been working on (and again – I didn’t quite finish it in time for this year’s county fair. So next year it is, for sure). Pastels, rather than the bright colors that I was using, made this beautiful crochet pattern look soft and dainty. This pattern, by Susan Stevens, is hosted here on my blog (if you don’t already have the link, click here). And last but not least is the Denna Square by Polly Plum that I started way back in July when I was in Chicago and didn’t finish until three months later in Alabama. At the very least, this square has done some road traveling! My project page on Ravelry is here. It was fun designing out the colors, and depending on where the color placement lies, this square could have a great deal of stylistic variation. I enjoyed making it. The year is winding down for the BAMCAL group, and their December squares are already available, which means that it’s time to finish up this year’s squares and start gathering ideas for the colors to use for the 2016 CAL. And if you’ve been thinking of joining in a crochet-along, this is a great opportunity to join in, which I heartily recommend. Doing these BAMCALs has improved my technique so much, and it’s a great and supportive group. The 2016 group is not up yet on the Ravelry boards, but you can read up on the discussion for colors and plans and join in as well here. thank you for sharing such a beautiful pattern! Awesome chrochet work. You are so talented. Thank you so much! I love these and I love your color choices. Can’t wait to try them.